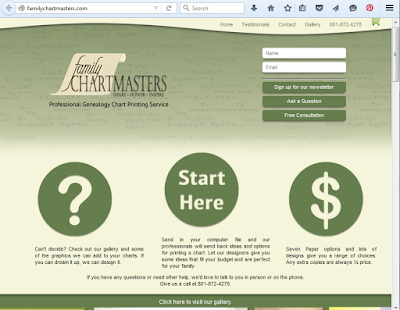 We are so excited to announce a new look to our Family ChartMasters website! Not only did we change the layout and make it mobile-user friendly, we added an extensive testimonials page showing off our happy customers and enhanced our chart gallery with over 40 different chart designs exclusive to FamilyChartMasters. 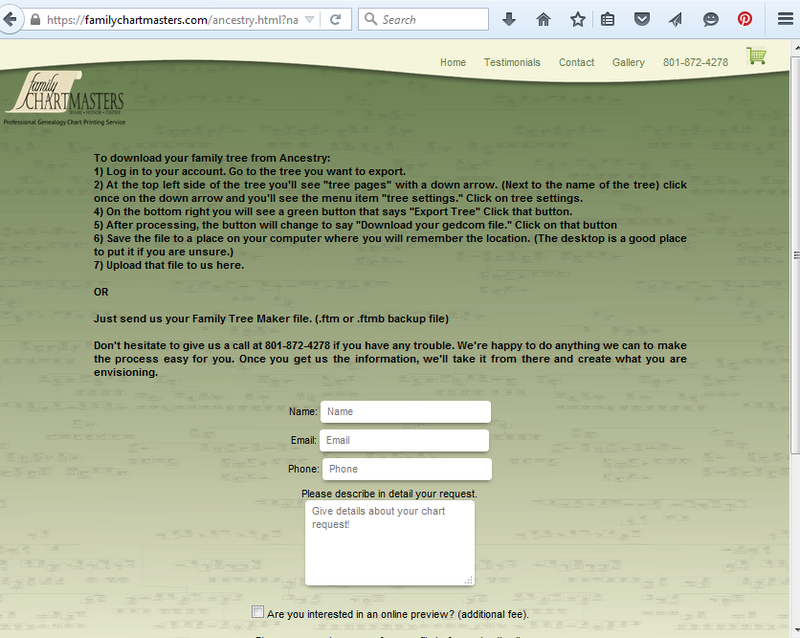 Also it is now easier than ever to upload your family tree to Family ChartMasters from Ancestry.com. Follow the instructions on our new webpage and we'll take a look at your file and get right back to you. We can create a chart from any type of genealogy computer data file such as Family Tree Maker, RootsMagic, Legacy Family Tree, Ancestral Quest, Family Tree Builder, The Master Genealogist, Personal Ancestral File, and many others. We would prefer the actual data file i.e. .ftm, .rmgc, .fdb, .paf, etc. All genealogy programs have the ability to export a .gedcom file and we can use that as well. Feel free to send us the whole file and we can take out just the parts we need. If you have your data on a genealogy website, we would need a .gedcom file to create the chart. Most websites have instructions to let you create a .gedcom file. You can contact the website company and ask for instructions on how to do this, or if you want to give us a call we can walk you through it over the phone. 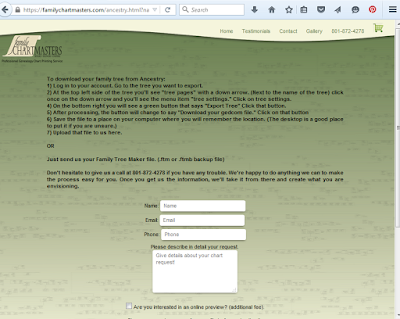 To download your family tree from FamilySearch, just use our easy Family Search Download Page. If you don’t have your information in a genealogy format, we can still work with what you have. We do need to eventually use a genealogy file but we can create one for you. We charge $15.00 per hour to do Data Entry. Just get us your genealogy information any way you can and we’ll send you a quote before we start. E-mail, Excel, Word—any format you can get to us will work. 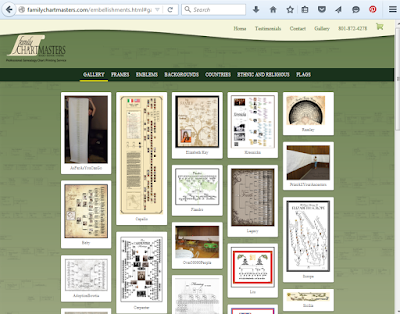 How do I create my own over-sized genealogy chart and have Family ChartMasters print it? What if I have something else in mind and it is not like any of the sample charts you have on the website? After 11 years of experience in building and printing a multitude of genealogy chart styles from every kind of genealogy file, we're confident in our ability to say that we really can print exactly what you're looking for. We'll do everything we can to create a beautiful representation of your family history. Family ChartMasters makes it super easy for you! Send us your file and we'll take it from there. We'll make you look really good. Your in-laws will love you.